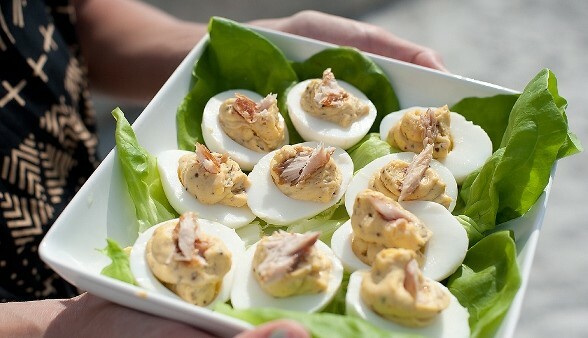 These deviled eggs are given a local flair with the addition of flaky smoked fish. Prepare eggs (hard boil, cool and peel) and slice in half lengthwise. Remove yolks and place in medium bowl. Place whites on a large serving platter. In bowl with yolks, add mayonnaise, mustard, salt, pepper and chile powder. Mash together well until desired consistency. Depending on how you like your filling, you may want to add more of either seasonings or mayonnaise/ mustard. Pipe the filling into the egg whites and sprinkle with smoked salt. Top with a good sized piece of smoked mullet and serve!